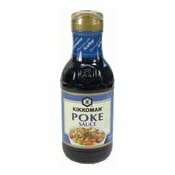 Savoury sauce for Poke bowl based on soy sauce with the rich aroma of sesame oil. Make a Hawaiian Poke bowl by simply mixing cubed raw fish with any other ingredients of your choice together with this sauce, and serve over rice. Keep in the refrigerator after opening and consume within 2 months. Ingredients: Soy Sauce (Water, Soybeans, Wheat, Salt) (42%), Water, Sugar, Modified Starch, Spirit Vinegar, Toasted Sesame Oil (1.7%), Concentrated Lemon Juice, Salt, Yeast Extract, Seaweed (Ascophyllum Nodosum) Powder, Capsicum Extract.